Historically, blue cohosh (Caulophyllum thalictroides, C. giganteum) has been one of the most widely used and highly relied-upon botanicals for augmenting labor, having been used to facilitate normal and efficient labor for more than 100 years. Conventional labor induction is one of the primary reasons why America has the worst infant mortality statistics of any similarly developed nation. Concerns based on case reports and mechanistic data about its potential fetal toxicity have caused blue cohosh to fall into disuse, thus potentially eliminating a once very important herb from the materia medica. The AHP monograph was co-authored and edited by herbalist, midwife, physician, and former AHP Medical Director Aviva Romm, and was based on her Yale doctoral thesis, as well as her original work conducted with midwives. In addition to Dr. Romm’s blue cohosh review being vetted by the Yale doctoral review board, the monograph was subjected to review by traditional herbalists, midwives, naturopathic physicians, medical obstetrics experts, and integrative medical doctors. 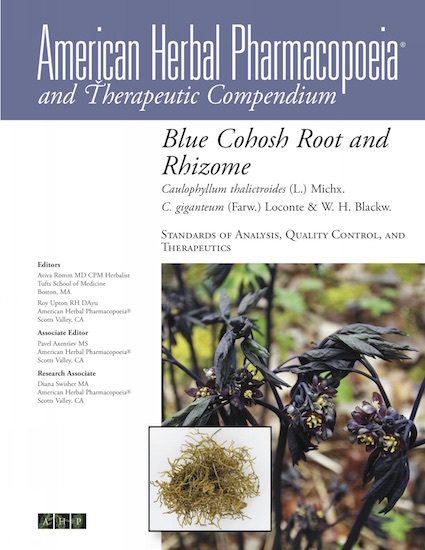 AHP embarked on the development of the blue cohosh monograph initially because of the importance of the botanical in the birthing and naturopathic medical communities, and subsequently because of the concern for its potential toxicity. AHP worked hard to strike a balance between the potential benefit of the herb juxtaposed against any potential risk, with the goal of fully informing the health care community and consumers about the strength of the evidence on both sides. During the development of the monograph, an interesting finding was the recognition of a second North American Caulophyllum species, C. giganteum, proposed in 1981 and accepted in the Flora of North America in 1995. C. giganteum and C. thalictroides have been used interchangeably throughout the history of the use of the herb, with herbalists unaware that they were two separate species. There are morphological differences and similarities between the two, though the chemistry appears to be identical. Although C. giganteum is not listed in American Herbal Products Association’s (AHPA) regulatorily accepted text on botanical nomenclature, Herbs of Commerce, the recognition of the species is important from the perspective of GMP compliance.